CHICAGO – Oliver Stone is back! In the latest HollywoodChicago.com Hookup: Film with our unique social giveaway technology, we have 40 admit-two movie passes up for grabs to the advance screening of the highly anticipated new Oliver Stone film “Savages”! “Savages” features an all-star cast including Benicio Del Toro, John Travolta, Salma Hayek, Uma Thurman, Emile Hirsch, Taylor Kitsch, Blake Lively, Aaron Johnson, Demián Bichir, Jonathan Carr, Joaquín Cosio, Shea Whigham, Diego Cataño, Jana Banker, Candra Docherty, Patrick Fourmy and Gary Stretch from director Oliver Stone and writers Shane Salerno and Don Winslow. The film opens on July 6, 2012. To win your free passes to the advance screening of “Savages” courtesy of HollywoodChicago.com, get interactive with our unique Hookup technology directly below. That’s it! This screening is on Monday, July 2, 2012 at 7 p.m. in downtown Chicago. The more social actions you complete below, the higher yours odds of winning! Three-time Oscar-winning filmmaker Oliver Stone returns to the screen with the ferocious thriller “Savages,” which features the all-star ensemble cast of Taylor Kitsch, Blake Lively, Aaron Johnson, John Travolta, Uma Thurman, Benicio Del Toro, Salma Hayek, Emile Hirsch and Demian Bichir. The film is based on Don Winslow’s best-selling crime novel that was named one of The New York Times’ top 10 books of 2010. Laguna Beach entrepreneurs Ben (Johnson) (a peaceful and charitable Buddhist) and his closest friend Chon (Kitsch) (a former Navy SEAL and ex-mercenary) run a lucrative, homegrown industry: raising some of the best marijuana ever developed. They also share a one-of-a-kind love with the extraordinary beauty Ophelia (Lively). Life is idyllic in their Southern California town until the Mexican Baja cartel decides to move in. When the merciless Elena (Hayek) and her brutal enforcer Lado (Del Toro) underestimate the unbreakable bond among these three friends, Ben and Chon – with the reluctant, slippery assistance of a dirty DEA agent (Travolta) – wage a seemingly unwinnable war against the cartel. And so begins a series of increasingly vicious ploys and maneuvers in a high-stakes, savage battle of wills. The “Savages” movie poster from Oliver Stone with Benicio Del Toro and John Travolta. 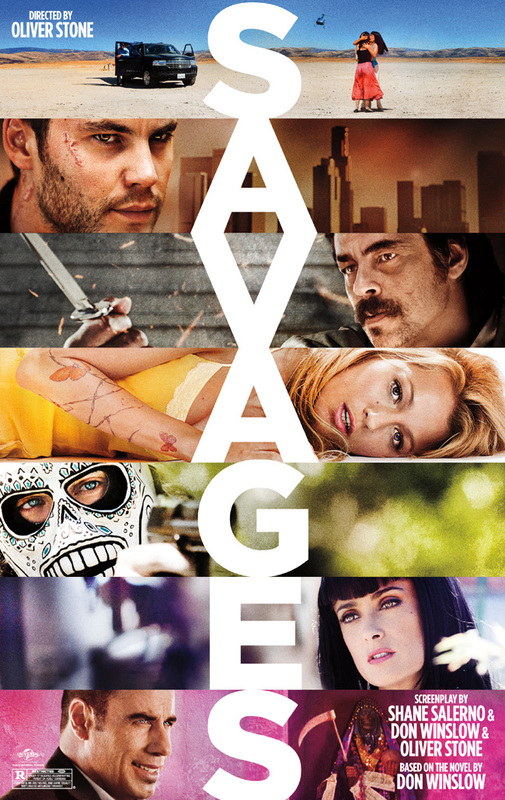 The “Savages” movie trailer can be watched now below. This HollywoodChicago.com Hookup is simple! Just get interactive in our unique Hookup technology above. We will award 40 admit-two movie tickets based on social entry numbers and/or randomly via e-mail for our “Savages” Hookup. Good luck!